ST. GEORGE – During his first State of the Union address before Congress, President Donald J. Trump touted the recent tax overhaul and called on Congress to come together on reforming immigration, rebuilding the nation’s infrastructure and providing for a stronger defense for the nation from potential threats. As with previous State of the Union addresses, the party of the president, in this case the Republicans, stood and clapped throughout the speech. Many on the Democratic side remained seated, though stood and clapped for individuals honored by Trump for their personal experiences. These were both tragic and triumphant and related to policies set in place over the past year and policies the president plans to roll out in the coming year. He acknowledged the year’s natural disasters and other tragedies, the Las Vegas mass shooting included, lauded improvements to America’s economy with all the benefits that flow from that to individuals and a growing workforce and declining unemployment. Trump said this after lauding recently passed tax reforms and their benefits to business and the middle class. Millions of Americans should also start seeing the benefits of the tax reforms in April as it will give them “more take-home pay,” he said. Trump also praised the repeal of the individual mandate portion of the Affordable Care Act that came with the recent tax overhaul. “Struggling communities, especially immigrant communities, will also be helped by immigration policies that focus on the best interests of American workers and American families,” Trump said. Trump called on Congress to pass a proposed immigration plan that he called a “fair compromise.” No one gets everything they wanted in the plan, but “our country gets the critical reforms it needs,” he said. The plan has four parts, or pillars, the president said. The first part allows a path to citizenship for 1.8 million “Dreamer” immigrants, that is, those who were brought into the county illegally by their parents while they were still children. 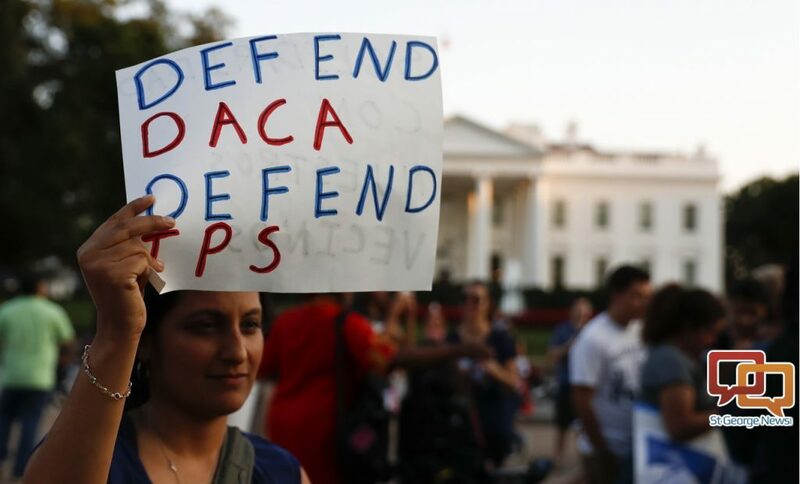 Once shielded under the Obama-era Deferred Action for Childhood Arrivals, or DACA, program, the future of the “Dreamers” – whom advocates note grew up in the U.S. and know no other life – became uncertain when the Trump administration rescinded the policy last year. The second part of the plan calls for a border wall, as well as closing immigration loopholes that are taken advantage of by immigrants by potentially violent criminals, Trump said. The third and fourth parts of the plan also call for an end to the visa lottery system and limits on chain migration to the United States that happens based on family ties (when a U.S. citizen or, in some cases, a green card holder petitions for a relative to join them). Mention of limiting chain migration earned Trump boos from parts of his audience. Trump called for a merit-based immigration system and bringing overall immigration policy into the current century. A great need for immigration reform is to protect the American people from criminals, particularly those associated with violent gangs like MS-13, Trump said. The United States is a compassionate nation. We are proud that we do more than any other country to help the needy, the struggling, and the underprivileged all over the world. But as President of the United States, my highest loyalty, my greatest compassion, and my constant concern is for America’s children, America’s struggling workers, and America’s forgotten communities. Continue reading news story below. “As we rebuild our industries, it is also time to rebuild our crumbling infrastructure,” Trump said. Trump asked for Congress to pass a bill for $1.5 trillion for new infrastructure projects. He also called for legislation to streamline the approval process for such projects. He also called for the nation’s nuclear arsenal to be modernized. North Korea was particularly mentioned as a potential threat due to its pursuit of nuclear missile capable of hitting the continental United States. “We are waging a campaign of maximum pressure to prevent that from happening,” Trump said. Just prior to the his State of the Union speech, Trump signed an executive order keeping Guantanamo Bay detention camp in Cuba open so it can continue to serve as a place to hold and interrogate accused terrorists. “As long as we are proud of who we are, and what we are fighting for, there is nothing we cannot achieve,” Trump said as his speech drew to an end. The democratic leadership volunteered to go to the SOTU address and than sat with arms crossed like pouting children forced to do something they didn’t want to. 2020? Haha… apparently you don’t see what’s coming at the end of 2018. The GOP is about to endure a slaughter like we’ve not seen in decades. There’s a big blue wave coming in. Grab your board and get ready to surf or pound sand. Apparently you don’t get it! The pathetic losers were sitting there pouting with their arms crossed……Delusional and funny, You usually don’t get both in the same package…haahahaha! You are right, there will be a whole lot of crying going on in November. A whole bunch of blue losers.. I printed out the smug spoiled, arrogant look of Pelosi’ sitting there during the State of the Union Address, and we are using it on the dart board. Everyone wants to take some of the copies to the target range, but I said no…that’s disrespectful and that is not what good Republicans represent. The SOTU is political theater with the occasional emphasis on educating the public. It is tradition for everyone in Congress to go, including the opposition or minority party. Its also been tradition for decades for said party to symbolically reject the rhetoric by sitting, not clapping, etc to policy statements that aren’t bipartisanship. That is acceptable and common decorum. And it was common throughout Obamas many SOTUs. And there wasn’t a better moment for that resistance than when Trump took credit for decreases in black unemployment and the Congressional Black Caucus sat unmoved. It was proper protest as such unemployment has been steadily decreasing since 2011, ie not some sudden change under this administration. I especially loved the part where Trump attempted to get the Democratic side to applaud and stand up with his hand gestures and disappointing gaze. Yes, It showed them as the crybaby un-American losers that they truly are..Did you ever win anything by pouting? hahaha! 1. The Boston Tea Party was an act of defiance against British rule. 2. Women have spent many years fighting to be seen as more than second-class citizens. 3. The GM sit-down strikes: Dec. 30, 1936. In the 1930s, big corporations were thriving on the backs of their workers, and the workers had had enough. 4.The Montgomery bus boycott: Dec. 5, 1955. You remember Rosa Parks right? 5. In 1963, 200,000 people marched through Washington to bring attention to the issues that black people continued to face in America. Even right wing nuts like yourself can’t deny their support for number 1 and 3.
and you are a crybaby..hahahaha!! happy losing !! If you are ever accused of having zombie brain syndrome, agree with them, they are correct. dons8120 – You state that we won by protest…..Americans have always been Americans that wanted to be free from British Rule, both parties are Americans and wanted same. Your # 1 was won by the Republican Party; #2 women’s suffrage was started by a Republican woman; # 3 is an example of the Democrats selling out to the unions run by the mafia and later under legitimate so-called organizations; # 4 is a response to the KKK that was started by the Democrats in the South to counteract the Lincoln’s (Republican) Emancipation Proclamation to free the slaves in the South; # 5 was for nothing as Black people at that time had been given equality, and slavery no longer existed. They keep it alive as they want superiority and not equality, and that is their agenda. Sadly, their agenda still prevails to this day. Did you get your information from a Bill O’Reilly book. There were no republicans in 1773 (hint : that is when the Boston Tea Party happened), we weren’t even a country, our first party was the Federalist party and wasn’t started until 1787. My point that protest can get things done in our country, whether it be by Democrat or Republican. I won’t even address the rest of your so called responses because they just make you look like a racist moron all by themselves. Your comments show the readers that you at best have a 3rd grade education along with John. Delusional donny, if your idea of protest is this inane “resist” movement, What are you resisting other than getting a job and a bath or exhibiting any semblance of common sense? Why are you so concerned about my bathing schedule? Do you have smell-o-vision? Once again you jumped into the conversation with nothing meaningful to say. I hope you haven’t reproduced, we need less idiots in this world. Yeah, everyone knows that the Dem’s don’t stand for anything, what was Trump thinking? Why are you here then loser?You do need a bath and an education .. The FEMA camps will be receiving you disillusioned liberals very soon..You can not survive on tide pods and liberal Kool-aid..so either chow down or shut up girly man! Trump and Co. taking us from the 21st century right back to the 20th. We’ve seen this hole before. Vote every last Republican out in 2018 and 2020. I think you need to get out of Death Valley! Like now! I live right here in SW Utah, genius. Nice try. Great speech. I hope the democrats get on board before they are left high and dry, I just doubt they will. They are already high and dry..
Booker looked high and Pelosi had drymouth…. Toilets should just flush it down, silently. Everyone knows Trump is a liar. Why would you listen to a liar, unless you want to be lied to? Trump, Pence and Ryan, the three Russian stooges. If Trump, Pence and Ryan are the three russian stooges, that makes jaybird a childish moron whose binky just fell in manure ! hahaha! Jay bird watches too much CNN! Must be getting cold here the snowflakes are floating around! Our President Trump did a great job describing the accomplishments and progress thus far and the plans and vision going forward. What has been accomplished is even more amazing when you consider the obstructionist Democratic Party and Washington establishment. Our President has a plan which includes growing the economy, increasing job opportunities and wages and reducing the size and bureaucracy of the federal government. Very soon, most Americans will see higher take home pay, the result of the recent GOP tax legislation. MANY corporations, realizing their tax liabilities are being reduced, are giving to their employees significant bonuses and wage increases. Unemployment is at a record low level, and for African Americans and Hispanics, the lowest EVER recorded. The stock market is booming, growing the personal wealth of MANY millions of Americans. The swamp is being cleaned, slowly but surely, most recently forcing out the head of our FBI and likely more to follow. The Obamacare penalty has been eliminated, so American citizens are no longer being forced by our federal government to buy something they may not want or cannot afford, and being fined if they don’t buy it. President Trump has offered a plan to address DACA and our broken immigration system, that would provide a path to citizenship for up to 1.8 million DACA candidates. It would also eliminate chain migration and the visa lottery system and allocate many billions to improve our border security AND build the needed wall. These are just a few examples of what he’s accomplished in his 1st year. The list is much longer. Meanwhile, the Democrats sit, pouting, complaining, obstructing, without any plan. President Trump shares how unemployment for African Americans and Hispanics is the lowest in recorded history. The Dems are shown sitting motionless, hands at their sides with sad and angry looks on their faces, while the GOP stands and applauds. The Dems are digging their own graves and don’t even know it. Keep telling yourself these delusional things. You sound like a Fox News talking point. You sound like a bad case of Trump Derangement Syndrome ! It’s a long time till 2024…hahahahahaha!! Happy losing ! I keep asking this question of the T rump supporters and just can’t ever get a reasonable answer. So far, the only answer is, “because he doesn’t have to”. The question is, “How do you support him not releasing his tax returns?” He spouts off about “transparency” but obviously that only applies when he has nothing to hide. Could it be that his businesses are doing business with foreign governments, in particular, Russia? Even Nixon, our previously most crooked president, released his taxes while under audit. I suspect that if he truly practiced transparency he wouldn’t have become our president. Hillary Clinton and Barack Obama both released all their tax returns from 2000 through 2015. Joe Biden released his from 1998 through 2015. Transparency, hmmm. The only republican to release as many years returns is John McCain. It will be a sad day for America if this guy ends the tradition of presidential candidates voluntarily releasing their tax returns, even if they don’t constitutionally have to. Old News.. Give it up already! .. Kick and scream all you want, you will not see them and most of us do not give a crap, only you and rachel madcow think it’s relevant.. have some more liberal Koool-Aid.. waah waah waah! Did you just use Crooked Hillary and Obama Hussein as examples of former Presidents and wannabe presidents as a great example of NOT hiding things? You say there’s only transparency with Trump when he has nothing to hide and then put Hillary and Obama on a pedestal for being transparent because they showed their tax returns. I care about facts! Not what your perception of why something is, show me the facts. I can think of a million reasons why he doesn’t show them, some of witch could be to hide something and some having nothing to do with having something to hide. More and more is coming out with facts about not only a lack of transparency, but serious criminal actions by the previous administration. Since not releasing something most definitely means something to hide under your assumptions, I wonder why the Democrats are taking panic to insane level about the FISA memo being released. I don’t give me this they are terrified about damaging information getting into the hands of our enemies. If the FISA memo doesn’t live up to the rumblings, I’ll be the first to take issue with members of my own party for making a big deal out of nothing. For now I could only risk about 10 to 1 odds that it will be nothing. Take my bet now cause each day more and more comes out so tomorrow I’ll be asking for 20 to 1 odds.